How do you join a traveling circus? A young performer spins plates as the crowd begin to enter the tent for Mr Fips’ Wonder Circus on April 7, 2014, in Huntingdon, England. There are many answers I could give you based on what kind of job in the circus you’re looking for, but for now let’s just start with your question of How can I? The first thing to do before doing anything else is ask yourself: Am I willing spend three to 11 months of the year on the road? Some circuses stay in one place (like Cirque in Las Vegas), but most are touring companies. Working with a traveling circus is exciting, but the lifestyle requires a real commitment and a certain amount of grit that not everyone has. You don’t just work for the circus—you live in the circus, too. It is very similar to camping. You must be prepared to live in a different environment every week. This means that the weather, the altitude, the crime rate, and general living conditions will vary drastically in every city you visit. You must constantly be prepared to adapt. Know that you will not be living a life of luxury. There will be power outages, no heat, no water, no groceries in some places. Although your co-workers will help you, in general you must be able to take care of yourself in these situations. If you are prone to claustrophobia or motion sickness, seriously consider whether you can handle a life of constant travel. You will be traveling by RV or train or bus, sometimes for days at a time. Your living situation will sometimes be cramped and uncomfortable. You will encounter problems and accidents on the road. Basically, if you don’t think you can handle the lifestyle changes that go along with a job in the circus, don’t apply. But if you think you’re up for the challenge, the next step is to make a list of circuses that you’d like to apply for. Assuming you are looking in America, there are many to choose from. As you probably know, larger circuses such as Cirque and Ringling will have career websites. Smaller “mud shows” like Big Apple Circus or Circus Vargas may not list career opportunities but will give you a contact email instead. I understand how difficult it can be to apply for any job online; you can never be sure whether your application is being reviewed or lost in the spam folder. Option No. 1: Scrape together $15 for a cheap ticket to a show. Many circuses have a preshow or an option to arrive early and meet performers. You could use that time to ask questions about current openings, the process of getting hired, or who to contact about applying for a job. And don’t just ask performers. There’s also circus concessions, the floor crew, animal crew, sound techs, and more. Ask anyone you come into contact with. Most people will at least be willing to give you the name of someone to contact. Option No. 2: Simply hang out wherever the circus is currently staying. You are likely to run into circus workers in and around the area they’re performing in, recognizable by their ID cards or work outfits. Be brave! If you see someone who works for the circus, walk up and ask about current openings or who to contact to get a job. Most people will appreciate your interest and at least hear you out. If legwork doesn’t get you anywhere, the next thing I would recommend would be to network using social media. Make friends in and around the circus. There are organizations out there that literally follow circuses from town to town. Circus Fans of America is a great example. Their website is a great source of circus news and events, and it’s free to view. Joining the organization and making friends would also give you insight into which circuses might be hiring at what time of year. Search for circus fan websites, Facebook groups, Twitter pages, blogs, whatever you can find. Many circus workers are accessible via social networking. If you want to be an aerialist, befriend an aerialist. If you have no acrobatic skills but still want a job in the circus, befriend a concessions worker or someone on floor crew. There are many types of entry-level jobs in the circus, and you never know when a spot will open up. Making contacts inside the circus will give you notice on openings almost as soon as they happen. Overall, I’d say if you really badly want a job in the circus, don’t give up. Every time an opening is posted that you want, apply for it, even if you’ve done so already. As with any job, persistence is key. 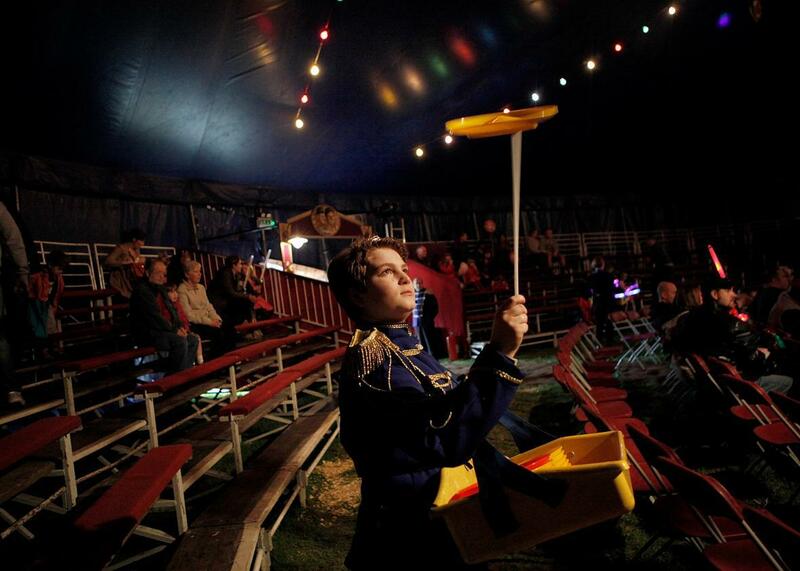 Circuses: What is it like to work at a travelling circus? Ringling Bros. and Barnum & Bailey Circus: How significant is it that Ringling Bros. & Barnum and Bailey circuses have decided to stop using elephants? Circuses: What is it like to be in the circus?